Today, I’m delighted to share with you images of a wonderful floral portrait of King George VI by five times RHS Chelsea Flower Show Gold Medal Winner, Joseph Massie. Last Friday, I met up with Joe to see the design. He had created it to mark the release of the film ‘Hyde Park on Hudson‘, which is released today on DVD and Blu-ray by Universal Pictures. The film tells the true story of the first time a reigning British monarch visited America in the summer of 1939, succeeding the events of the film ‘The King’s Speech’. It features Bill Murray as President Roosevelt, Olivia Colman as the Queen Mother and Samuel West as King George VI. 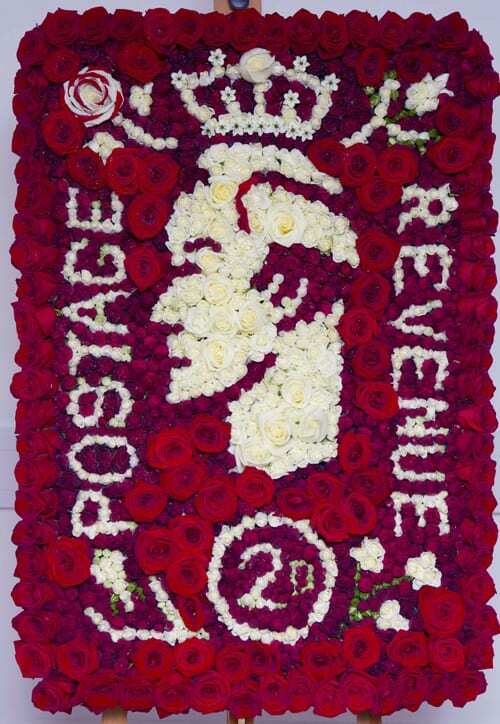 Joe’s floral tribute to the king was inspired by the stamps that carried his image during his reign. 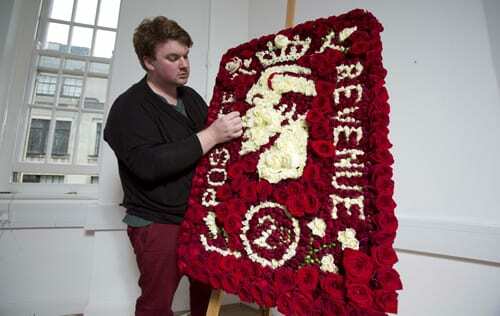 He created it on a floral foam design board using 250 ‘Red Naomi’ roses to provide a bold backdrop. 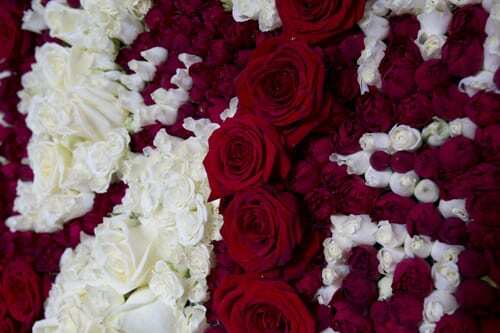 For the smaller details, he used white ‘Akito’ roses, red and white spray roses, plus Ornithogalum arabicum. Joe said: “With this design, I wanted to encapsulate the feel of the British countryside, combined with the regality of the ‘Hyde Park on Hudson’ storyline. Many congratulations to Joe on creating this wonderful floral portrait! P.S. You may remember that Joe created a floral portrait of the Duke and Duchess of Cambridge earlier this year.